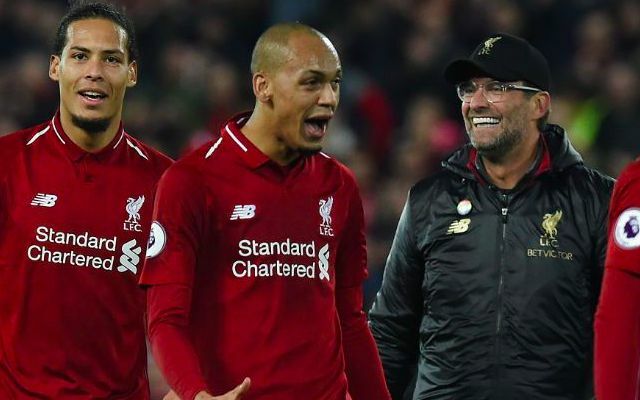 Jurgen Klopp admits Fabinho would have struggled for fitness had Liverpool been scheduled to play next weekend. The Brazilian was forced off in the 87th minute of Saturday’s 4-3 win over Crystal Palace after suffering a suspected hamstring problem. It proved a premature end to yet another standout display from a player that continues to look more important to the Reds by the week. Liverpool’s early elimination from the FA Cup means they will not return to action until their Premier League clash with Leicester on January 30. Speaking after the game, Klopp said: “I would imagine Milly out now and Fabinho for sure a doubt, it would have been a massive challenge if we should play on Wednesday and Saturday again,” per the Liverpool Echo. Fabinho’s absence would be an untimely blow for the league leaders, with the midfielder in his strongest form since signing during the summer. The 25-year-old was a disruptive force against Roy Hodgson’s side, thwarting the visitors’ attempts to counterattack and providing reliable cover for the marauding runs of Andrew Robertson. He also showcased his vision and execution with the ball at his feet to find James Milner’s run in the build up to Mohamed Salah poking home Liverpool’s third. James Milner is meanwhile a certainty to miss the Reds’ final game in January after picking up a late red card on Saturday following his second bookable offence on Wilfried Zaha. It remains to be seen how Klopp addresses the situation at right-back as he continues to wait on the return of both Joe Gomez and Trent Alexander-Arnold from their respective injuries.